Over my lunch break today I caught a wonderful exhibit at the National Gallery of Art entitled Faking It: Manipulated Photography Before Photoshop. The exhibition opened in mid-February and runs through May 5th. It moves to Houston in July to October. One of the singular points the exhibit drives home is the fact that photography has always been subject to manipulation even from its earliest days when daguerreotypes were hand-colored to make them more ‘realistic’, and skies were printed in via multiple negatives to compensate for the shortcomings of early emulsion formulas. 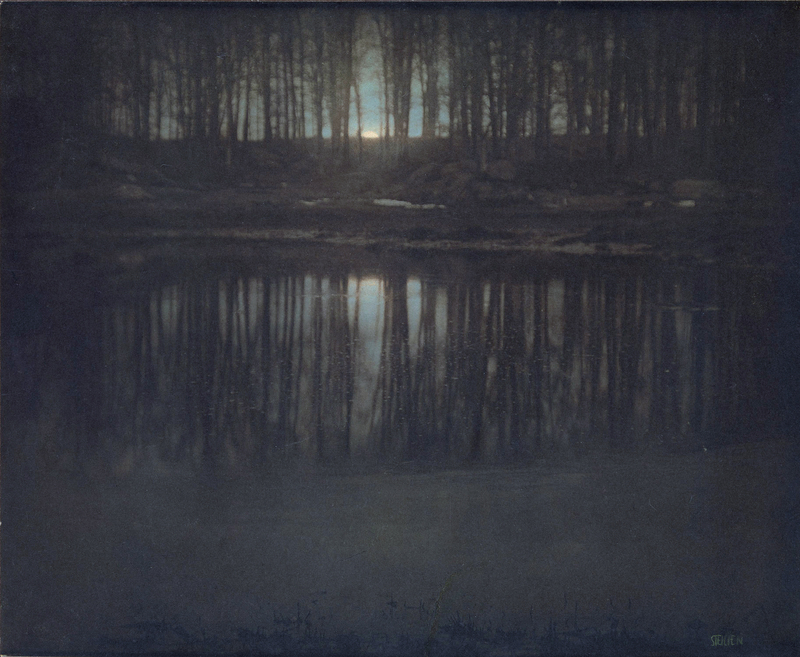 One of the coups of the exhibition is the inclusion of Steichen’s “The Pond – Moonlight” from the collection of the Metropolitan Museum of Art. Most people familiar with the work know it as a multi-layered gum bichromate over platinum print. What most don’t realize, however, is that the image may in fact be a composite with the moon having been added, and may also never have been photographed by moonlight (a feat that would have been difficult to achieve with the emulsions available even in 1904). The moon in the image may be an addition or otherwise a manipulation of the print, and the nighttime feel of the image merely an effect of the color choices in the gum layers of the print. Images have been manipulated for a whole host of reasons, from a desire to make them more real (hand-colored daguerreotypes) to conveying an inner reality (surrealist photography) to evoking an emotional resonance (The Pond, Moonlight) to suggesting a reality that could exist (a Zeppelin docking at the docking tower of the Empire State building) to creating something that never existed (giant crickets consuming giant produce on the back of a wagon) to re-shaping reality for political ends (Nazi and Soviet propaganda posters and publicity photos). All of the above are represented in this exhibit, and placed in an historical and artistic continuum. There has been much controversy lately over questions of photojournalistic integrity with regards to digital manipulation to include/exclude details to tell a story, from the Iranians photoshopping additional rockets into a picture of a missile test to Edgar Martins getting caught claiming his work was unmanipulated when in fact he was heavily altering his images. This is not new, but in fact the question of manipulative ethics is far more unsettled for far longer than most people realize. In 1906, Horace Nichols was photographing the Epsom Derby on a rainy day. There were gaps in the crowd, so to convey the feeling of the event he wanted to convey, he spliced in a whole sea of additional umbrellas. This was common practice for Mr. Nichols, and he rarely cited it in the captions of his images, but he sustained a career as a serious photo-journalist. It makes you think long and hard about your assumptions of photographic verissimilitude and the historical moment in which photography ‘ceased to tell the truth’. The exhibition is well worth the visit if you have an interest in the history of photography and questions of honesty and integrity of the photographic medium. I’ll be up in New York in April for a weekend and so I’ll try to catch it then and see the two shows as brackets for one another. The comparison should be very interesting.